As a college student in Singapore, I interned with an investment bank where I learned how real-time data was used every second to shape big and small decisions in the finance world. But, as internships and volunteer stints with non-profits in India made me realize, why isn’t the data being used the same way in healthcare, education, environment, and crime? This motivated my co-founder Varun Banka and I to start SocialCops. The goal was to empower organizations and leaders with all the information they need to make decisions in real time and confront the world’s most critical problems. We moved to India after graduation and spent an entire year doing pilots to understand why it was so difficult to use data in the developing world. The single-biggest bottleneck, we found, is the data itself. The single-biggest bottleneck, we found, is the data itself. Information is still largely recorded on paper registers and files, most of which never make it to a digital format. Some data that does is often stored in local languages and unstructured file formats, making it extremely difficult to be extracted. Even in the rare case when the data is in a consumable format, it gets stored in siloed, disconnected systems which just don’t talk to each other. For example, the district of Nagpur alone has 32 different health data systems. In another case, the number of villages in the country can vary from 640,000 to almost a million, depending on the data source being used. That’s not all. In most data sets, there are inconsistencies in the names of geographical units due to misspellings or multiple names. The first time we matched two data sets at the village level in India, we got only a 15 percent match. That’s because one dataset would use the name “Mumbai” and another “Bombay”. One dataset would spell Pomburna and the other Pompurna. The SocialCops’ data intelligence platform seeks to address precisely this mismatch. We realized if we could bring all these data sets together and present insights in a simple, intuitive way we could help decision makers make more accurate data-driven decisions. When the 2030 Agenda for Sustainable Development was announced two years ago, the entire world rallied around the quest to achieve a more equal and secure world. However, the biggest challenge remains unanswered — how do we even know we’re on our way to achieving these? 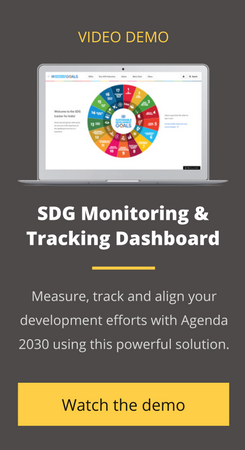 To track the 17 Sustainable Development Goals and 169 distinct targets, we need data across sectors, from multiple data sources and divergent information systems. What is a bigger problem is that this data is collected with a time lag — the Census is conducted once in 10 years and the National Family Health Survey once in four years. The first goal of Vision 2030 is to end poverty. But how do we know we’ll ever get there if the next time we measure it is in 2021 — and in 2031 thereafter?! Read more about the history of the Indian Census and why it was started in the first place. In one of the most exciting deployments of our platform at SocialCops, we are partnering with the United Nations under the leadership of the Government of India. In one of the most exciting deployments of our platform at SocialCops, we are partnering with the United Nations under the leadership of the Government of India to build a dashboard that brings together data from over 100 data sources dynamically to help monitor India’s progress towards the Sustainable Development Goals. Once developed, the dashboard can be easily customised to suit the needs of state governments and adapted by other countries as well. Our team at SocialCops is getting a chance to witness firsthand how data intelligence is transforming development programs. For example, India’s Union Petroleum Minister Dharmendra Pradhan is using a dynamic data dashboard we created to track in real time the performance of the PM Ujjwala Yojana – the government’s national scheme to provide gas subsidies to women below the poverty line. Read more about how we used data intelligence to power the Pradhan Mantri Ujjwala Yojana, one of India’s fastest executed schemes. Sitting in his room, he drills down to every district to assess performance and calls District Nodal Officers to understand the bottlenecks they are facing. The focus on data and monitoring in real time seems to have helped — the Ujjwala Yojana is the only national scheme to surpass its annual target. The government gave out 2.2 million gas connections, getting the country a step closer to SDG 7 of Clean and Affordable Energy for All. Data intelligence is increasingly being used by forward thinking leaders to make informed decisions – ranging from the Niti Aayog which now uses a dashboard to track the key performance indicators of 89 national ministries to district collectors who are now allocating budgets to areas that need them the most, based on data-driven, bottom-up planning. To get a fighting chance at achieving the SDGs by 2030, we need to radically rethink our development programs. For decades, development programs have operated in silos — a nutrition program has focused solely on nutrition, and an agriculture program only on farming. But development does not occur in silos. A girl child could drop out of school because her teachers aren’t of the requisite quality (education challenge), the girl toilets in school are not functional (sanitation challenge) or because she fell severely ill (health care challenge)! To get a fighting chance at achieving the SDGs by 2030, we need to radically rethink our development programs – break down silos, focus efforts on areas that lead to maximum impact, and more importantly, course-correct in real time, not five years later. The article was originally published on the United Nations India blog and has been reprinted here with permission. 4 Data Collection Techniques: Which One’s Right for You?